Cutting down VTSC Greedo's vest? Looking at the Greedo vest, I think my only complaint about it is the fact that it's too long and shouldn't go over the belt. I'm wondering if anyone has been brave enough to cut one down to the proper length. I'm afraid to do it and unravel the whole thing, but it seems like an easy fix as long as you can cut it straight....so does anyone out there have enough extras that they're willing to experiment on them? Re: Cutting down VTSC Greedo's vest? I do not have extras but once they go on clearance I'll pick up a few and let you know how it turns out. Nooker, do you have any of the previous Greedo figures? There are three other ones that came with removable vests (all the same sculpt of the POTF2 Commtech one) that you could just put on it instead. And in this case plastic looks better than the cloth one. Also for trimming down and other ideas, maybe check out the customizing section here. note - JD STAFF - I only hosted that image because I couldn't get it to show from the Image Database here? I think a simple cut across the bottom with a good pair of scissors would shorten it if you wanted... The fabric isn't a woven one if I'm not mistaken (I'm no seamstress to know too well but I think I'm right) and it should just hold its shape. The stitching at the seams is what I'd be concerned about unraveling but it could be ok. I have 2 opened of this dude. My second one I put the yellow vest from POTF Luke ceromony figure. He looks nice and lemony. Mmm lemony. I wonder if Rodian tastes like seafood. I'm certain that Mon Calamari, Aqualish, and Quarren do. Based on EU lore didnt Wuhr use Greedo's body as a new drink? I never knew that. 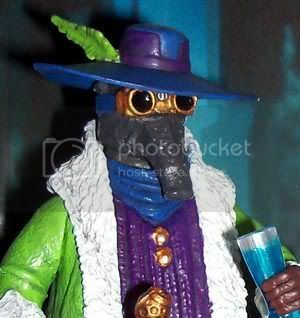 But yea plastic vests look cool on the VTSC Greedo. Yeah, it's explained in the book Tales From The Mos Eisley Cantina.